Many people love mythical creatures and can want to know as it would be a world dominated only for them. Which of them do you wanna to do? Why? well thers an idea... a race of anubis! If a creature with two or more vertebral column it's possible, a world of hydras or scylas (a water hydra) will be really cool too. I might... but definately not Greek/Egyptian/Roman mythological creatures though. 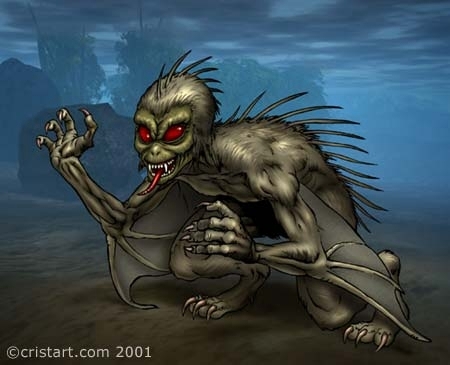 I might like to make a few Asian mythological creatures, but the greatest fun would be to make some modern mythological creatures like the Chupacabra for example. I have a funny feeling that i'll get sick of seeing dragon species, or more likely, 4+ armed/legged dragon species. It does have some general descriptions though that could be used to make up model. Thats just kinda what I meant. Dragons have general western and eastern images, but I was never aware of the chupacabra ever having one truly accepted image. Though im always behind on my myth and folklore, its why i asked. Maybe they just need better agents and perhaps some better magazine reviews? Or is that guy in your avatar space in the tryouts for the "Face of goatsuckers 2006"? I will create lots of dragons to annoy Hydro! Couldn't you use a bunch of limbs that have been fattened at the ends to make a 'skull'? hmm, i wonder if there'll be easter egg like mythical creatures (high points in everything, amazing physical ability)... that'd be awesome. If flying creatures are in, I plan on a black, two-headed, two-tailed dragon. I'm not sure if it counts as a mythical creature but i'd definetly recreate metal gear ray! I'll make the best possible recreation of a phoenix, making a large bird that is all red, or maybe giving said bird extra feathers going backwards and coloring them a different tint of red so that it looks as if the thing is on fire as it flies. I dunno, but I will create a phoenix. For anyone who is in to alternative religious stuff, I would highly reccomend reading a collection of Jewish creation myths called the Haggadah. (I think that's how it's spelled. o.o) Anyway, it talks at length about all of the fantastic creatures that were around when God first created the Earth, including some really bizzare ones. The one that first comes to mind is the 'man of the earth', which looks exactly like a human, only it has an umbillical cord of sorts that keeps it bound to a single place on the ground, meaning it can only eat whatever is stupid enough to wander into its radius. While it resembles a man physically, it is a brutal creature, furious at anything it cannot touch. Mmmm maybe but I doubt it. I'm most likely to make movie based creatures such as Xenomorphs, ALiens from War of the Worlds, Species 8472 etc. It might be fun to do centaurs at one stage, or a variation to that theme. The spine seems flexible enough to make that incredible 90 degrees angle. That my friend....SCARED THE CRAP OUT OF MEEEE!!!!!!!! If I'm really bored one day I might make one otherwise I'm sure there will be enough of them out there. Of course if i run into any poorly designed mythological creatures or dragons I won't bother filtering them out, i mean what else would i have my handy UFO capability to destroy planets for? Nothing says "I went into the editor and threw random things together" like a jackalope. I look forward to seeing many other small rodents with unnecessary horns as well. Some things are just must-haves. You don't necessarily have to let them conquer the universe, but they would be nice to keep on a dozen or so zoo planets. Anubis was an anthropomorphic Jackal. And as to those fans of Ligers, you do all know that Ligers are a danger to the ecosystem right? They're infertile creatures that waste the valuable breeding capacity of endangered animals. Ligers are litterally an unintended threat to the existance of their parents. Now, while you enjoy that little slice of sadness, I'd think it'd be neat to add something like Stymphalian Birds. They don't look too impressive, but they're actually covered in metal that naturally grows on their body, and have a loud metallic screech. Some use claws, some breath fire. Take your pick. I wouldn't mind adding Nightwalkers to the list of creatures. Huge, lumbering behemoths with burning eyes. No, I didn't. But seems cool! The Goatsucker is one of the creatures I plan on making(maybe even for my main race!). it looks like a huge vampire bat with a goblin face. cewl. to be real, could it not just be a undiscovered animal, like the boogie man or Micheal jackson. We don't know. No one who has ever seen one has lived to tell about it. Du du duuuuuu <---dramatic music. that no was has seen a chupakrabra whatever the hell it is. My mythical creature would be, Buh Buh BAH!!! A Smart president!! Maybe an Air Rod? Though I doubt you could ever do it.... And not really mythical but....damnt I just wanna link the air rods somewhere! We know they're in. Enjoy your dragon. As for me, I might make the mythical Ravenous Bugblatter Beast of Trall. Since there aren't any pictures of it, I'm free to make it up the way I imagined it. Personally, I'd say it's a lot like a Megatherium (Giant Sloth). i bet they have badass camo.